Everything is going smoothly today… life is just drifting by and you with it. With Venus conjunct the node and sextile Jupiter it is as if nothing can bother your or get in your way of the peace and happiness you feel. There is nothing wrong with this and whilst you are in your own little world you can actually accomplish a lot. If you have been having problems with your partner then today is the day to plan something together as the planets are smiling down on you to do so. From the looks of this image though you may want to make your time together low key and not spend it around other people. This is a day about togetherness and strengthening the bonds you share. It is not the day to go out and join others unless you have a point to make by showing solidarity because today you surely will be showing the strength of your solidarity together. 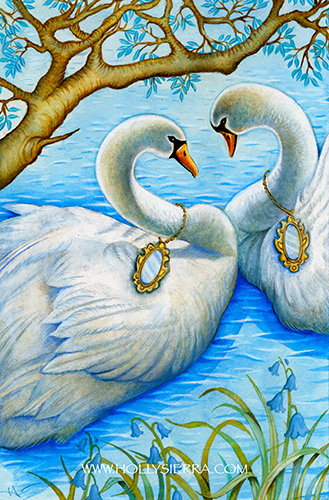 Notice as the swan’s heads come together and they gaze into each other’s eyes the posture forms the formation of a heart alongside their hearts meeting and joining together at the base of their chests. This is something you can use to your advantage today and even if you have no one in your life and are single perhaps it is time you looked at yourself in the mirror and repeated all of your best qualities to the reflection you find there. It’s amazing what you will find if you dig deep enough and with the beautiful Venus/Jupiter transits today you will find something to smile about. Just allow yourself to be taken gently with what life throws at you today because it won’t be throwing much and it won’t be throwing anything you can’t deal with. The card used for today’s tarotscope — Two of Mirrors — comes from the Chrysalis Tarot series by Holly Sierra and Toney Brooks. This deck is available for purchase directly through the Chrysalis Tarot website and through Holly’s Etsy storefront. Here’s Holly’s Facebook page and the Chrysalis Tarot Facebook Fan Page. This deck is also now available for download for IPhone, IPad and Android devices through the Fool’s Dog website. wow … I love that! and yes it fits so well not just with this card in particular but with the Two of Cups in general! thank you for that Ellen!